I also included many of my favorite wildflower photos in this year’s exhibit on the Panhandle Trail. This photo of a Deptford Pink was included in “Sun Shadow Ice & Snow: Seasons of the Panhandle Trail 2015”. 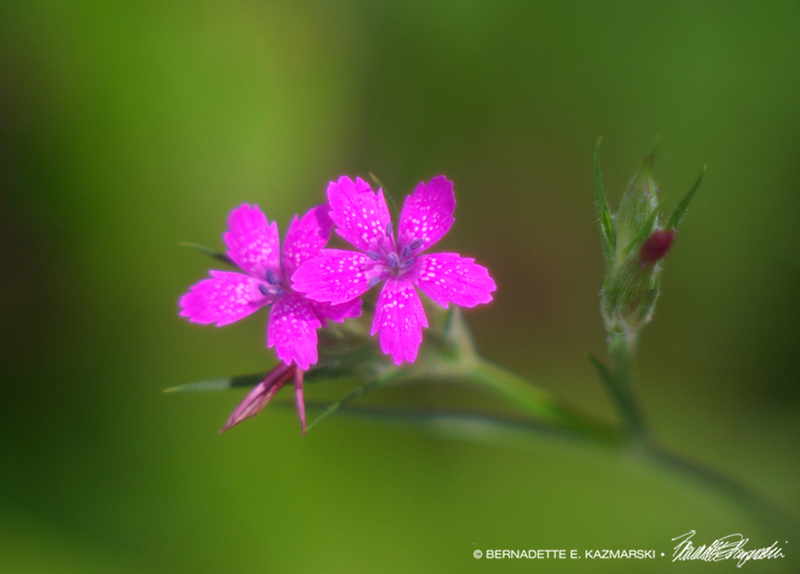 Taken from my photo gallery, “Panhandle Trail, McDonald to Walker’s Mill, Mid-June 2009“, this Deptford Pink is tiny but vibrant enough to stand out in a field of wildflowers and was included in my exhibit, “Sun Shadow Ice & Snow: Seasons Along the Panhandle Trail 2015”. The colors will cheer you in any season. This print is available in such a variety of styles and sizes I only have the image for display. The white signature you see will not appear on any prints purchased. I sign each print by hand. The photo is matted with Arctic White acid-free mat and a solid wood white frame. Frames may vary in style and finish, but are always about 1″ wide. Framed prints are signed on the photo and on the mat. I usually have at least one of the smaller sizes of canvases on hand, but order larger ones as they are ordered here because customers often want a custom size. Smaller canvases are a 3/4″ in depth, Canvases 12 x 16 and larger are 1-1/2″ in depth. I set them up so the image runs from edge to edge, then the sides are black or white or sometimes I slip in a color that coordinates with the painting. This canvas is wraps around the sides. Shipping cost is included. You can find the photo in my Etsy shop.